When Mark first came to Shark Tank and pitched Gold Rush Nugget Bucket, I wasn’t immediately sold. In fact, I even backed out! But the more Mark talked, the more I began to change my mind. His invention is not only innovative but I can see the passion he has for entrepreneurship clear as day. 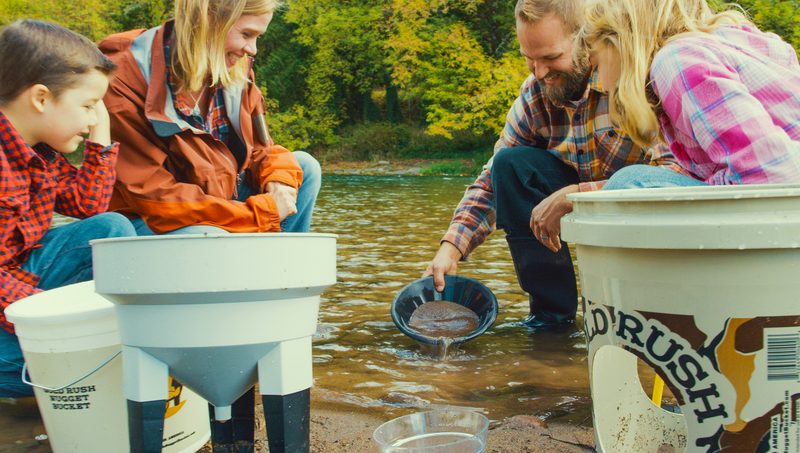 From building a gold panning kit for his daughters in his garage to mass-producing them for families around America, Gold Rush Nugget Bucket has certainly hit the mark! 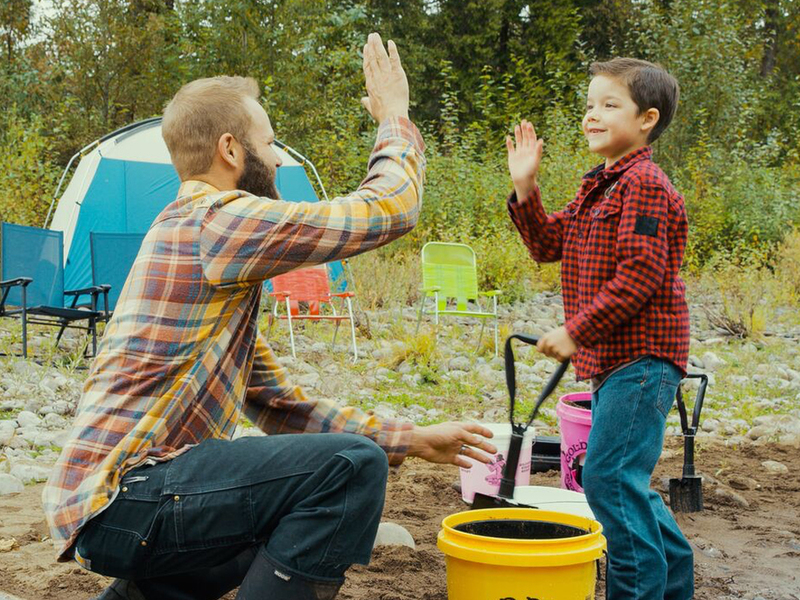 I’m so excited to partner with Mark and help bring some outdoors fun for families everywhere. You can find the Gold Rush Nugget Bucket on their website and in Sportsman’s Warehouse. An exclusive version of the product is also now available on Amazon Exclusives. How do you motivate yourself to work so hard? In business, taking one step at a time to achieve our long-term vision and goals. Personally, my kids motivate me to be the best person I can – both at home and at work. So what made you start your business – what was the big ‘aha!’ moment? I started my business for two reasons. First, I’ve owned a small mortgage company for the last 16 years and have seen some really good and not-so-good times. As a result of the recession and financial difficulties, I wanted to find a way to spend time with my two daughters that could get us outdoors and spend time together. I made a makeshift gold panning kit in my garage that my girls ended up really enjoying. They didn’t find gold, but what caught my attention was their enjoyment of just playing with rocks, water and spending time with their dad. It was a validating feeling for me to be able to provide a great experience for them. Second, I feel like I see opportunities where many others don’t. I like to fix or make things better, and as a result, I was able to evolve a makeshift kit into the Gold Rush Nugget Bucket. Taking an idea from conception to market was both challenging and exciting for me. 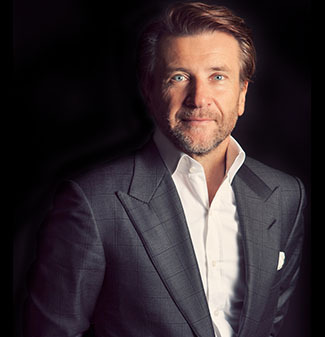 What are the lessons you learned from your appearance on Shark Tank? The Sharks look at the person selling the product more than the product being pitched when deciding to invest or not. Simply being on Shark Tank doesn’t ensure success. It’s what the entrepreneur does with the experience that determines their success. 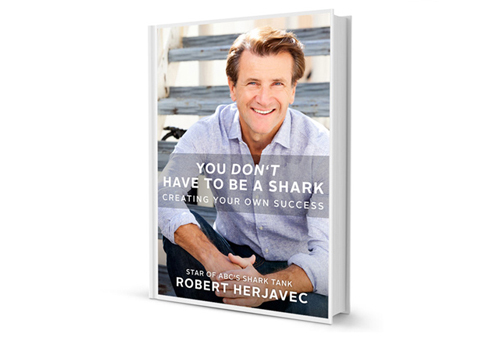 Most entrepreneurs who enter the Tank, me included, have a fear of giving away too much of their company in exchange for a partnership with one of the Sharks. It’s a risk because the future is uncertain and I had no idea what kinds of opportunities I would have working with you, Robert. That being said, I am very happy with my decision! Of course I think you chose the best Shark too! Let’s go back to the beginning — How did you know this is what you wanted to do? Do I have the necessary skills to produce it? Once I did my due diligence and understood that my product passed those tests, I knew I wanted to pursue it. What does success mean to you? More importantly, how do you measure it? When I first started the company, my goal was to make $50,000 profit per year, provide employment for my brother and get my kids, all kids, playing and experiencing the outdoors more than they are now. Today, I define my success as simply being happy with what I do on a daily basis. I think a lot of people become more caught up in the pursuit of achieving financial success than defining what success really means to them. “Life’s short, be happy” is my personal motto for that reason! But there’s a price for running a business – what was yours? There is always a “price” to be paid when starting a new business, both in time and money. It’s the management thereof that determines the sacrifices that will ultimately be made. A big challenge for me is balancing the time needed to run my businesses effectively while keeping my promise, to myself and my family, of being a great father and husband. The greatest sacrifice I made was liquidating my family’s entire retirement savings in order to fund the business initially. Needless to say, this combined with the time spend was not easy on my marriage, but I have managed both well enough to this point to find success for the business. The road to success isn’t always smooth. Was there a time you failed? What did you learn from that experience? After graduating college with an undergraduate degree I enrolled in an MBA program. I failed to meet the grades needed to continue and had to drop out. Thinking my dreams of business management and entrepreneurship were over, I convinced myself that I didn’t need the MBA degree and could find success another way. Over the years, I determined what I was best at and could hire for the skillsets that I lack. As it turns out, this is exactly what super successful entrepreneurs do! As you know, sales is an integral part of any business – what was the biggest sales hurdle you had to overcome? How did you move past it to reach the next level? My biggest sales hurdle, as it is for many small business owners, is how to market my business online. I knew how to make a great product and run a business, but I knew very little about website design, online marketing, search engine optimization, etc. 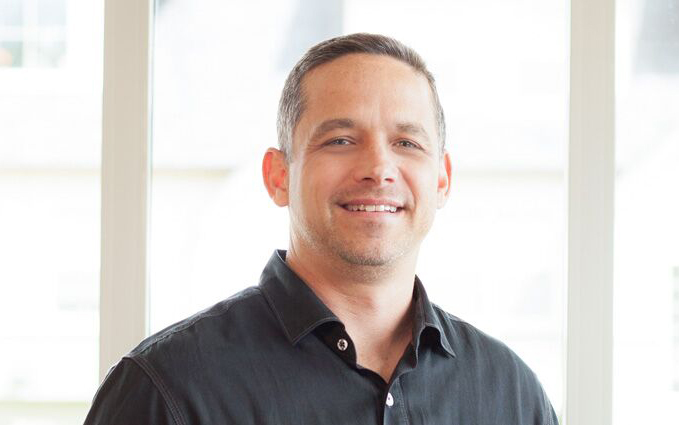 My solution was to hire a millennial, someone that is inherently “current” with today’s fast-moving digital world, which I see as a critical requirement for moving our business forward. That’s when I hired David Hyslop last year as my Digital Marketing Manager. Since then, we’ve established a new marketing strategy with the development of a new website, promotional videos, and advertising and content marketing tactics. Our stronger online presence and reach have helped us grow our business both online and in stores. Let’s talk about your recent partnership with Amazon Exclusives and Sportsman’s Warehouse. Why did you pick these retailers to partner with? Well Amazon is definitely a great marketplace for online shoppers, and we thought partnering with the Amazon Exclusives team could be a strategic way to increase our brand presence. By working directly with such a dedicated team, we’re able to coordinate additional ways to market our brand and reach our target audience. We’re very excited for some upcoming opportunities working with them. Part of our strategy in 2016 was to enter big box retailers since many people, especially in the sporting goods industry, still prefer to shop at a store as opposed to online. When Sportsman’s Warehouse reached out to us with interest in stocking our product, we knew they would be a great fit because they have a great reputation for providing high-quality outdoor goods and equipment. We’ve been impressed with how well sales have performed in their stores and we’re happy to partner with them to get more people outdoors. Lastly, what’s next for your company? 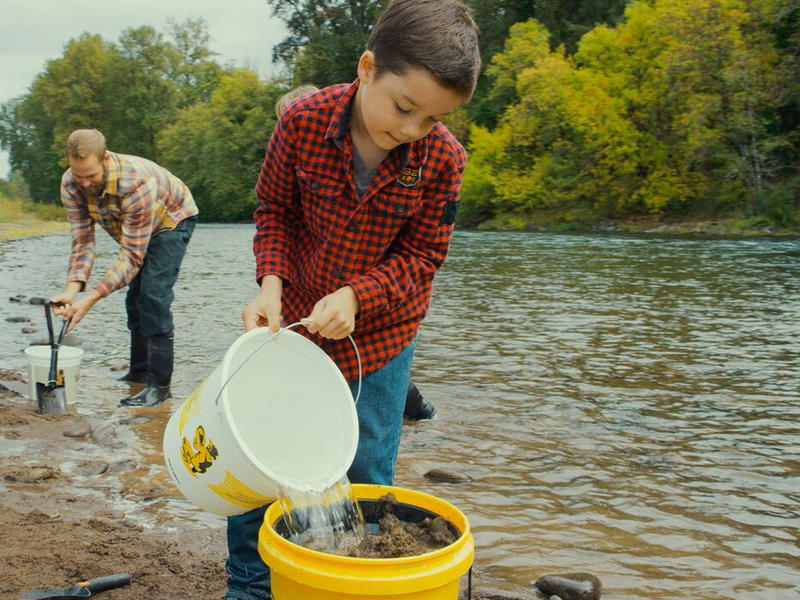 Where will we see Gold Rush Nugget Bucket in the next year? One significant goal for us is to get our product in the hands of anyone who wants to explore the outdoors and find gold. To accomplish that, we want to get the product in brick and mortar stores, small outdoor retailers, and major outdoor sporting goods stores. Thankfully, our camouflage kit is in sixty Sportsman’s Warehouse locations in the US and we also now have a deluxe version of our kit on Amazon Exclusives so we’re on our way to achieving our goal! I see success as the ability to overcome a series of failures again and again, learning from each as you go. One significant goal for us is to get our product in the hands of anyone who wants to explore the outdoors and find gold. It’s been my lifelong dream to come up with a new product design, patent it and take it to market.